Western blot analysis of extracts from HeLa, C2C12, C6, COS, MvLu cells and guinea pig neutrophils (GPN), using β-Actin Antibody. β-Actin Antibody detects endogenous levels of β-actin. 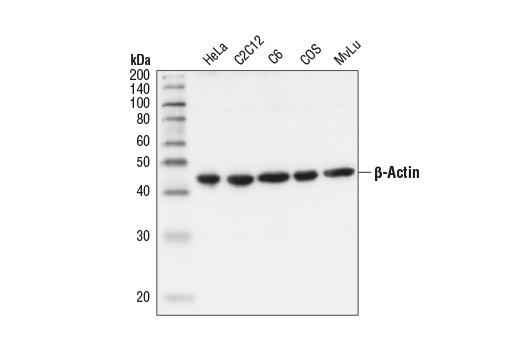 This antibody may cross-react with the γ-actin (cytoplasmic) isoform. It does not cross-react with α-skeletal, α-cardiac, α-vascular smooth, or γ-enteric smooth muscle isoforms. Polyclonal antibodies are produced by immunizing animals with a synthetic peptide corresponding to amino-terminal residues of human β-actin. Antibodies are purified by protein A and peptide affinity chromatography.